Coconut Fingers by elenore1973. A Thermomix <sup>®</sup> recipe in the category Baking - sweet on www.recipecommunity.com.au, the Thermomix <sup>®</sup> Community. Add all Base ingredients in the TM bowl and set dial to closed lid position and knead for 1 minute on interval speed . Place dough into a prepared baking tin and push down to bind together. Cover with a layer of jam. Without washing the bowl (optional) place all Topping ingedients into the TM bowl and mix for 5 - 10 seconds on speed 6. Scrape down the bowl and mix for a further couple of seconds if necessary. Gently spread Topping over the jam layered base in the prepared baking tin. Bake in a preheated oven at 180°C for approximately 20 minutes. Remove from oven and leave in baking tray until fairly cool. Cut into fingers to serve. If you want the base to have a thick base use a 28cm x 18cm slice tin/dish. For a thinner base a 35cm x 38cm slice tin/dish is recommended. 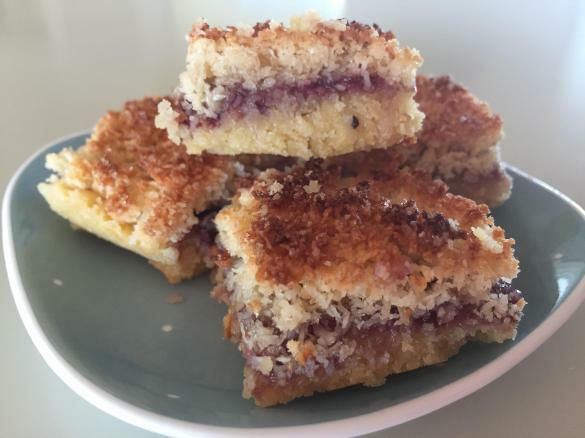 This recipe has been adapted from the Country Women's Association Classic Cookbook and credit must be given to Mary Hanslow, Orielton Branch, Tas. Good on you, Mary. This recipe is a ripper. Submitted by eggplant on 7. February 2019 - 12:05. This recipe is very easy. TM 5 handled double quantity easily. 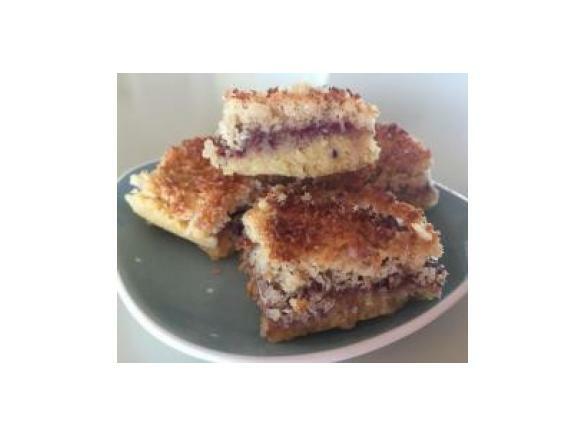 In view of Marelle7's comment made 2.5 quantity of topping which was ample for 2 Lamington trays (24 cm x 30 cm approx). I think the original quantity would have been enough for that size tray. Still in the oven, so 4 stars til I do a taste test! Great result. Love only cooking once. Many recipes need to cook base first. definitely 5 stars! Submitted by Marelle7 on 21. July 2018 - 12:17. This is so simple, yet delicous. I did however need to double the quantity of topping to get a good coverage. Can be served as a slice or with icecream or custard for a desert. I can't beleve no one has posted great reviews on this recipe!